When you consider the time taken to employ, manage and develop staff, their value to the business is even higher still. Managing your staffing levels, ensuring they are well trained and their hours are recorded correctly will have a big impact on the bottom line. Get this right and you will enjoy the benefits of experience and longevity in your team. As a care provider, making sure your staff are eligible to work in your care home is vital. Once you’ve checked all of that, you need to train them up to be an excellent employee. Having a full record that your staff have passed all the pre-employment checks and qualifications attained will give you the peace of mind that your home is delivering a safe service. When CQC walk in you need to demonstrate all of that to them pretty sharpish. They don’t have the patience to wait for you to wade through boxes of files and folders. The quicker you provide it, the more assured they will be that you are on top of things. It’s all saved here in your CoolCare4 staff record for you. All you need to do is open CoolCare4 and run a quick report. For each staff member, keep a full record of the eligibility and identification checks you have secured during recruitment. For renewable checks, such as DBS, you can set a renewal period so you remember to secure an updated check at a later point. Make sure all your staff are up to date by running the exception report to identify any missing records. Log a team member’s holiday entitlement, holidays accrued and holidays taken. Securely upload documents relating to a staff member’s employment with you. Whether training achievements, contracts of employment, counselling minutes or certificates, keep them all together in one place. If you have a Head Office who you need to share documents with, simply upload them here and your colleagues can access them directly. Managing your rota can feel like you need Sherlock Holmes’ powers of deduction to work out which shifts are uncovered, who was meant to be working it and who is now available to cover. CoolCare4 says goodbye to any such woes with its easy-to-plan rostering tool. By working to shift patterns and assigning individuals to them, you can define exactly how you want your home to be staffed. 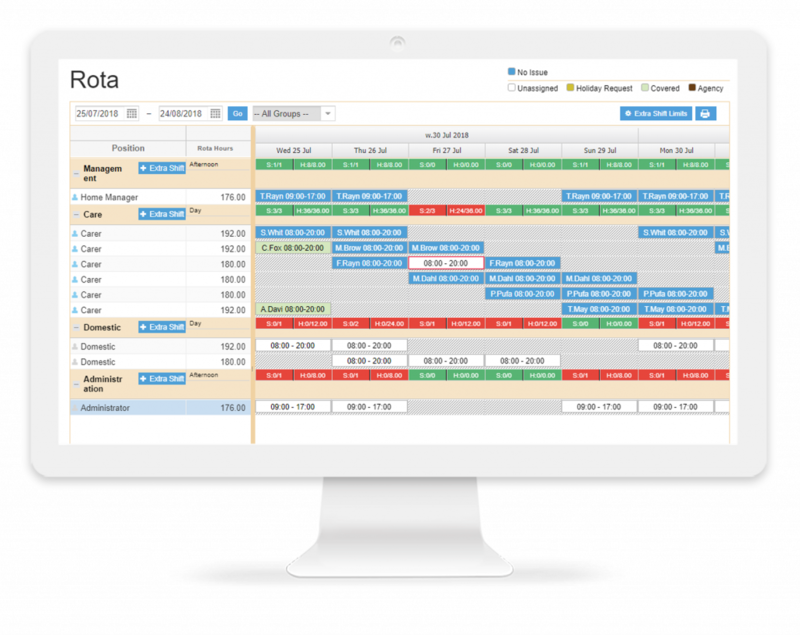 CoolCare4 provides clarity in staffing ratios, enabling easy advanced management and covering of shifts during times of absences and/or vacancies. Knowing you have the right number of people, with the appropriate qualification, in your home at any given time is the cornerstone of rostering in residential care. Staff turnover can be high. What was once a clear rota pattern gets lost as staff move on. On CoolCare4, patterns are preset by you. Define how long your rota is, the shift pattern you want each position to work and it will repeat for ever – regardless of which member of staff you later allocate to it. You can restrict who is able to plan you rota patterns so you keep complete control of the working patterns of your team. It jumps off the page when you have an empty shift on CoolCare4. When you spot one, just click on it. A list of appropriate staff members who should be available to cover will appear, with the best-fit staff listed first. You can plan as far into the future as you’d like! Your predefined shift patterns will create shift and hour budgets for each shift group, by time of day. 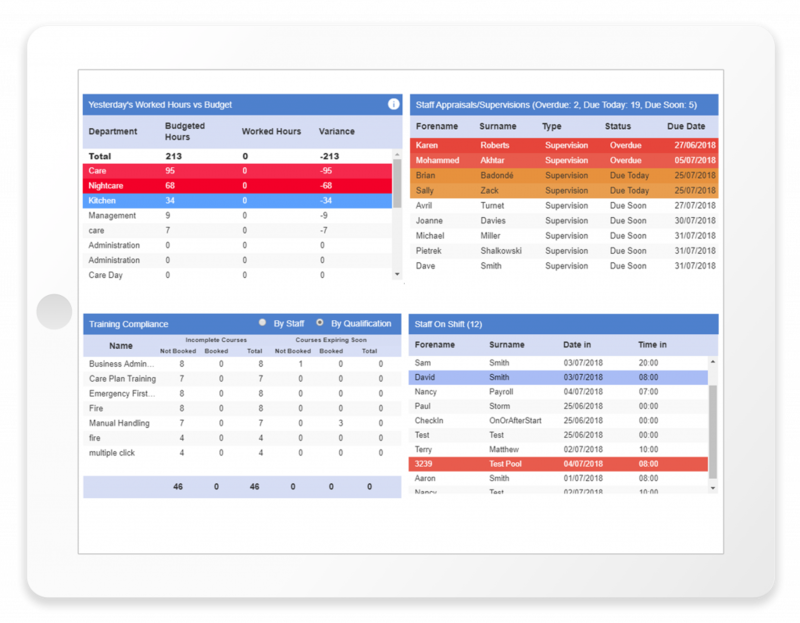 As you populate your rota with staff, your budgets will go from red to green so you know you are on top of planning. If you want to add extra shifts to a certain day – no problem. Your budgets will go blue to show you are over hours/shifts though! How you want to see your shift patterns grouped is entirely up to you. Some care homes like to roster by department. Others by time of day. Some like to see it by ward. CoolCare4 gives you the full flexibilty to be as granular with your shift groups as you like. As soon as you authorise a staff member’s absence, holiday or training, opt to automatically take them out of the rota. Their shifts show as uncovered and a note left to show the usual worker is on leave. Managing your staff well requires lots of engagement by HR and home teams alike. Each employee has to have the requisite training and keep it up to date, you have to undertake regular supervisions and make sure periodic appraisals are underway. Working in a residential dementia care environment is no mean feat and your staff need guidance and support to ensure they are continually developing their skills. When you have 10s, 100s and possibly 1000s of staff all on different training and appraisal schedules, keeping up to date with who needs what takes organisational nous. CoolCare4 records all that information and sets renewal periods to prompt you when a staff requires an update. Keep a record of any important discussions you have with a team member so you can follow up in a timely fashion. You can define the renewal periods for supervisions and appraisals to ensure your staff get the frequent contact and performance reviews they need with you. Each staff member has a full record of the training they have achieved. CoolCare4 will also let you know, based on their position, whether they are missing any of your required training. Any expired or soon to expire records will be highlighted so you know to get a training day booked in. Any missing, expired or soon to expire supervisions, appraisals and training records for your staff will be highlighted on CoolCare4’s helpful dashboard as soon as you log on. Tap the staff member listed and you will be taken straight to their file to update their records. Care homes need to avoid using agency staff wherever possible. They are costly and affect those already-tight margins, not to mention impact on care levels, but is unavoidable when your staffing is not well-managed. 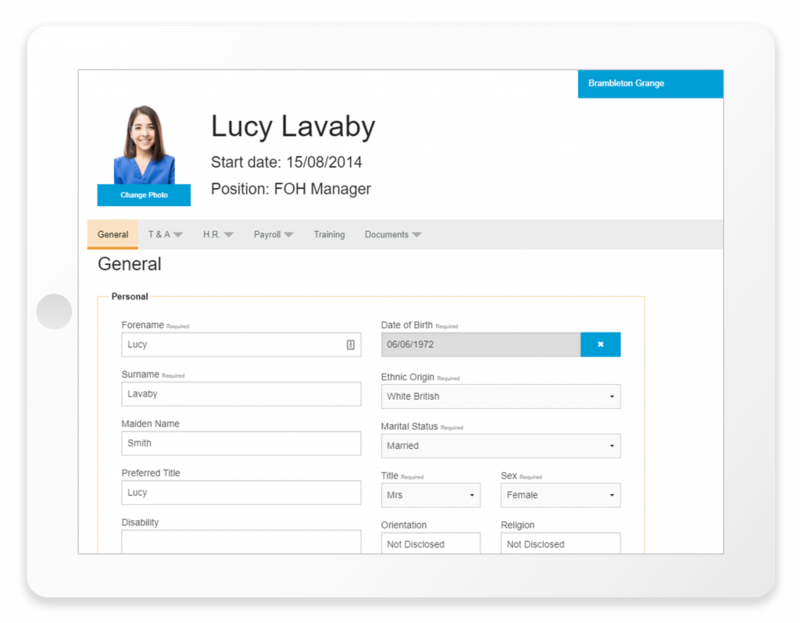 CoolCare4 will help you monitor staff turnover, manage training and appraisals, and forward plan your care home rota. If you get this balance right, you will avoid the need to dip into that back-up agency resource. Through CoolCare4’s business reporting and analysis suite you will be able to monitor your care homes’ performance and identify those tell-tale signs of recruitment/retention need. Compare your staff budgeted hours to those worked. Monitor staff turnover and vacancies. Track staff holidays and absences. 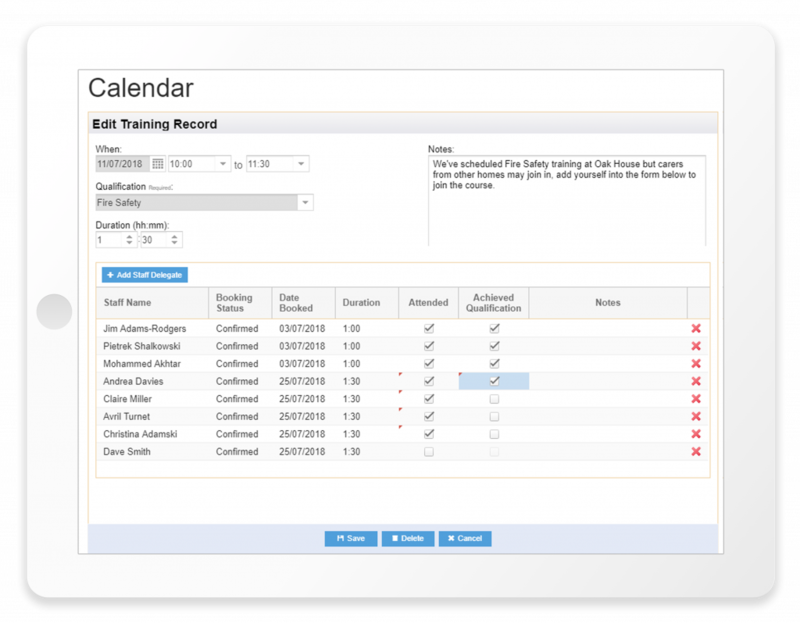 Keep your staff training up to date with the training matrix. Export contact details of staff and residents for mail-merging.